A canoe is like a banjo—it makes everyone happy. Propelled with paddles, sleek, long, narrow, lightweight—mostly open—and fast: Every canoe I’ve owned makes me smile at its memory. I remember my oldest daughter, at age 10, mimicking the cry of a loon, and the loon crying back, while on a Boundary Waters trip. Or that one big fish that one time in that one hole whose location I’m never going to disclose because then it won’t be my memory alone. Originally, canoes were made from trees nearby the rivers, lakes, and seas they traveled on. My personal canoe convoy mirrored the development of synthetic materials—fiberglass, aluminum, Royalex and multiple boats of Kevlar—that have been used in the construction of the ubiquitous craft since World War II. The canoe design—perfectly adapted to its place—predates the arrival of Europeans on American shores, but also includes the most modern materials through the space age and beyond. Improbably, the more the canoe’s materials change the more it seems to echo a simpler time. Native Americans used two main canoe designs for water transportation. In the northeast and upper Midwest, the birch-bark canoe was the primary craft. A bark canoe was built right-side up—a wooden skeleton surrounded by bark, lashed together with roots, planked, ribbed, and sealed with pitch. In the south from the Gulf of Mexico and west to the Pacific Ocean, the dugout canoe served. A dugout was just that—a log partially hollowed with tools and fire, expanded with hot water and sharpened at the ends. Both were born of ecological necessity; the paper birch forests supplied the raw material in the northeast, while in the south and west that job went to cypress, redwood, cedar and other species. Native American canoes typically did not have seats, so paddlers knelt, leaned against a thwart, or sat on their heels. Both types, but especially the bark canoes, could be tweaked to local tastes, whether practical, spiritual or artistic. Prior to European settlement, the basic canoe shape was so successful and well-engineered that the French, English, and Dutch explorers who showed up on these shores could not improve upon it; the most successful of them, the fur-trading voyageurs, co-opted the vehicle as their own freight-hauler. Both canoes ruled the waves for hundreds of years through the resettlement of the continent, before steam power in boats and trains shoved them aside. Shortly after the Civil War, the canoe was repurposed not as a workboat, but as a way to escape from work. 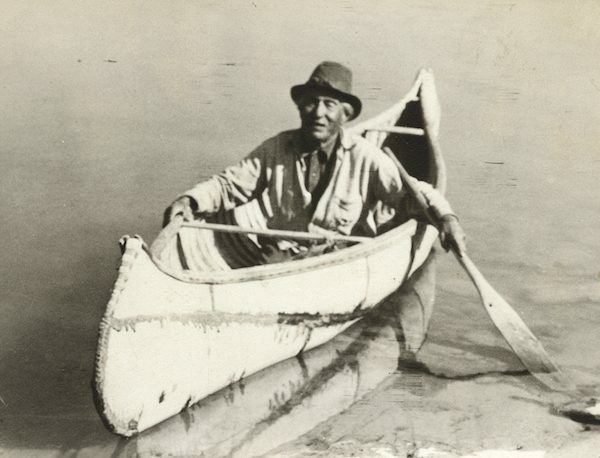 Increased leisure time and the professionalization of recreational hunting and fishing gave the canoe new duties. Magazines popped up describing the best ways and places to chase fish and game, or to simply get away from modern, industrial cities. There was an element of nostalgia, perhaps, in some of the best canoe literature, even as all the writers remarked on the solitude, the restfulness, the back-to-nature soul fulfillment of quiet days on the water. But these new “sports”—as they were called—didn’t always paddle traditional canoes in their pursuit of happiness: Manufacturing advances and a scarcity of right-sized birch trees drove the development of new canoes built upside-down from strips of wood over molds, rather than right-side-up from bark. A William English canoe, made in the 19th century near Peterborough, Ontario. It is among the first all-wood canoes made in a strip form. Upstate New York and Maine, with their miles of navigable streams, became centers of American innovation using the new methods. In New York, builders such as J. Henry Rushton and authors such as George Washington Sears, under the pen name Nessmuk, popularized the longitudinal-wood strip crafts among hunters, anglers, and adventurers. The design originated in Canada and spread with the help of social organizations such as the American Canoe Association, which held events that included popular races. The idea of the canoe began to expand: Some had decks and looked a lot like today’s kayaks; others featured sails. Though sold as a way to escape the pressures of the city, the canoe’s construction managed to mirror American manufacturing pretty closely. After the economic collapse of 1893, a cheaper building technique—wood overlaid with canvas and coated with a special waterproof sauce—gained popularity. Prices fell dramatically. While the Rushton Canoe Company charged $170 for a fully outfitted sailing canoe at the turn of the century, wood-and-canvas canoes made in Maine by the Old Town Canoe Company went for $30 to $40. Canoes were not just about getting away from it all; they were also an escape from scolds. At the turn of the century there was a fad of young men and women paddling together on rivers such as the Charles, Detroit, Schuylkill, Potomac, and urban areas such as the Chain of Lakes in Minneapolis. Courting canoes, in which the bow paddler faced the stern—the better for the couple to gaze into each other’s eyes—kicked off a craze called canoedling in which the opportunities for intimacy were taken full advantage of, much to the chagrin of dry land preachers. Legislation and arrests inevitably followed, with one young man fined $20 for kissing his sweetie in a canoe on the Charles River in 1903. At that price, millions of dollars’ worth of smooches were exchanged on weekend evenings across the urban rivers of the nation. The graceful forms of the wood-and-canvas canoes began to fade from the marketplace after the Second World War. Compared to the postwar synthetics, wood-and-canvas boats were expensive, heavy and needed fairly regular attention. The material that shoved them into dry dock was aluminum and the Grumman Aircraft Engineering Corporation of Long Island, N.Y. led the way. Aluminum boats, stamped out and riveted or welded, flooded the post-war market. Purists said there was no romance in a clanky metal boat, but Grumman paced the industry in sales from 1951 to 1976. By the mid-1970s, fiberglass, various laminated plastics and Kevlar did to aluminum boats what aluminum did to wood-and-canvas—beat them by price, practicality, and performance. Even newer space-age material such as carbon fiber or coated nylon, which does not compete on price, creates boats that weigh less than a roller suitcase. By 2005, a manufacturing association estimated that 90,000 to 110,000 canoes were sold annually; soon cheap plastic kayaks surged in popularity, based on lower prices and ease of use. Canoe campers love Wenonah Kevlar canoe for its light weight, sleek design, and durability. is professor of communication and journalism at the University of St. Thomas in St. Paul, Minnesota. He is the co-author, along with Norman Sims, of Canoes: A Natural History in North America (University of Minnesota Press, 2016). Primary Editor: Lisa Margonelli. Secondary Editor: Sophia Kercher. 1. Lee Moorhouse, Log Canoe on the Columbia River, c. 1900. Courtesy of the Lee Moorhouse Photograph Collection. 2. Chippewa Indian kneeling in canoe, c. 1914. Courtesy of the Minnesota Historical Society. 3. The Wee Lassie canoe was made in 1893 by J. H. Rushton for the use of William West Durant. The canoe is 10 1/2 feet long and weighs 20 pounds. Courtesy of the Adirondack Museum. 4. 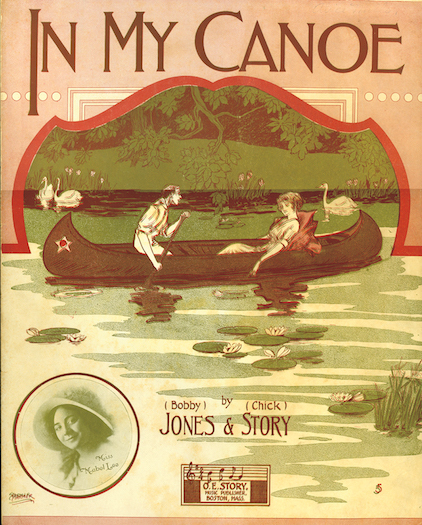 Cover from sheet music for "In My Canoe," a song written by Bobby Jones and Chick Story, published by O. E. Story in 1913. Courtesy of the John Summers Collection. 5. 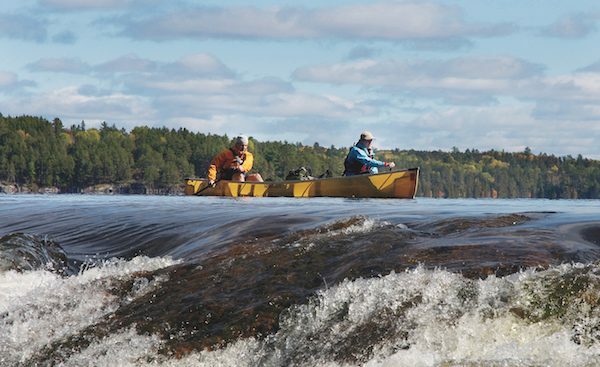 A Wenonah Kevlar canoe glides through the Boundary Waters of northern Minnesota. By the turn of the twenty-first century, Wenonah was the largest Kevlar canoe manufacturer in the world, with an annual output of around 10,000 boats in a good year. Photography by Ray Goodwin. Do Beautiful Parks Strengthen Democracy?